Michael Morgan and Benjamin Lougheed were Concert Prize Winners of the 2014 CGST International Guitar Competition held in December of 2014. Michael Morgan began his guitar studies at the age of thirteen with David Hoge at the David Hoge Guitar Studio in Tallahassee, Florida. He continued his guitar studies at Leon High School with Ed Prasse and was a three-year member and student director of Frets, the advanced guitar ensemble at Leon High School. He was an inaugural member of the Florida Music Educator’s Association All-State Guitar Ensemble, as well as a member for the next two years until his graduation in 2013. He has studied privately with several FSU alumni, including Dr. Eric Robles, Dr. Adam Foster, and Dr. Stephen Robinson. He has participated in masterclasses with Pavel Steidl and Jorge Caballero at the Domaine Forget in Quebec, and was a prize winner in the first Classical Guitar Society of Tallahassee International Competition. He is currently pursuing Bachelor’s degrees in Music Performance and Music Education with Bruce Holzman at Florida State University. Michael will perform works by Frederico Moreno Torroba and Johann Sebastian Bach. Benjamin Lougheed attended the Peabody Institute of Johns Hopkins University, where he studied with world-renowned teacher and current department chair Julian Gray, earning his Bachelor’s of Music in Guitar Performance with honors. He is currently completing his Masters of Music in Guitar Performance at Florida State, where he is studying with Bruce Holzman, who was recently inducted into the Guitar Foundation of America Hall of Fame. He has participated in master classes with several of the most accomplished guitarists in the world, including Jason Vieaux, Ana Vidovic, Denis Azabagic, and Paul Galbraith. Benjamin will perform works by Johann Sebastian Bach and Roland Dyens. 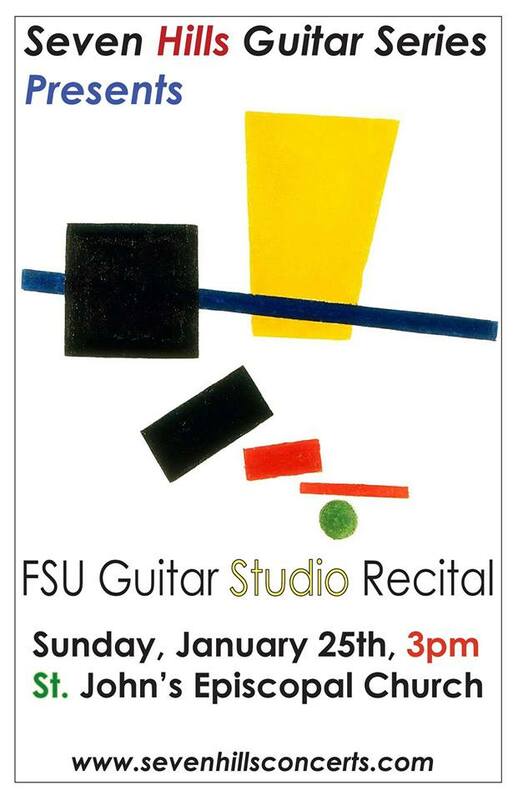 Vijay Meunier is a classical guitarist from Austin, TX, currently pursuing his bachelor’s degree in guitar performance from Florida State University. In high school, he was a member of the McCallum HS Chamber Guitar Ensemble, and studied privately with Jon Dotson and Joe Williams, members of the acclaimed Texas Guitar Quartet. In his freshman year, Vijay received the Texas Young Masters award from the Texas Commission on the Arts, allowing him to travel to the Domaine Forget guitar festival in Canada, the Iserlohn festival in Germany, as well as various guitar events around the U.S. Vijay has been awarded top prizes in guitar competitions around the country, including 1st prize in the youth division of the 2012 Texas Guitar Competition in Dallas, TX and 1st prize in the undergraduate division of the 2013 Mississippi Guitar Festival in Hattiesburg, MS.
Vijay will perform works by Antonio Lauro, J.S. Bach, Fernando Sor, and Manuel Ponce. Jesse Acker-Johnson is an active performer, composer, and teacher in the California, Massachusetts, New Mexico, and Florida music scene. Jesse Acker-Johnson first began to play and study music as a young teenager. He played in rock and jazz ensembles as an electric guitarist before concentrating on classical music. While studying to earn his B.A. in Philosophy, he began studies in classical guitar With Michael Chapdelaine at the University of New Mexico. He then continued his studies with Marc Teicholz while studying to earn his B.A. in composition from California State University East Bay. Jesse recently graduated with a master’s degree in classical guitar performance where he studied with Eliot Fisk at The New England Conservatory. Together with Mr. Fisk, Jesse is currently compiling collections of Renaissance lute music transcribed for guitar. Jesse has performed in America and Italy. His concert venues include play in churches, community centers, resting home, museums, private homes, and recital and concert halls. His compositions range from solo guitar and piano to use of electronic media and site-­‐specific recordings. Mr. Acker‐Johnson is a dedicated and committed educator. He actively engages in outreach within his community, spreading the word of music and the guitar to listeners young and old, and while giving lessons and classes. Jesse is currently pursuing his Doctor of Musical Arts degree in classical guitar at Florida State University studying with Bruce Holzman. Jessie will perform works by Heitor Villa Lobos, Frank Martin, Anthony Holborne, and David Bowie.